Our fleet includes more than 180 pieces of equipment, and while we implemented a periodic inspection program many years ago, there are still times when job requirements make it impractical or inefficient to bring certain machines back to the shop as scheduled. In these situations we try to send a technician to the various job sites to check things out. We also rely on operators to perform basic functions, such as checking the oil, air in the tires, and even making minor repairs when necessary. But, there are times when some things fall through the cracks, and that’s exactly what happened with one of our Ingersoll-Rand DD14 Rollers. This machine usually travels from job to job, and as a result, it passes through many hands along the way. By the time it showed up at the shop, we found the engine coolant was significantly low, apparently due to a leaking radiator core. Further inspection indicated the radiator had become loose in its mount, which caused it to make direct contact with the blades of the cooling fan. As you can probably guess, the spinning fan damaged the fins, eventually making a few holes in the tubes, It was at that point, about halfway down the face of the radiator, that coolant was getting out. We’re not sure how long the roller was operated while it was low on coolant. The operators we spoke with said they didn’t notice anything wrong with the machine, and since it was cold outside at the time, we had to take them at their word. Making these repairs was pretty much straight forward, and we decided to send the radiator out to be recored rather than replace it with a new part. Anyone who’s dealt with cooling system components for machines like these knows that sometimes they can be quite pricey, and in this case it was cost prohibitive to go with new parts. Not a big deal though, it only took our local radiator shop just a few days to complete the job. Basically what they did was power wash and clean up the old parts, desolder the tanks and replace the damaged core with a new section. After pressure testing they repainted the entire unit. The DD14 radiator now looks as good as new. 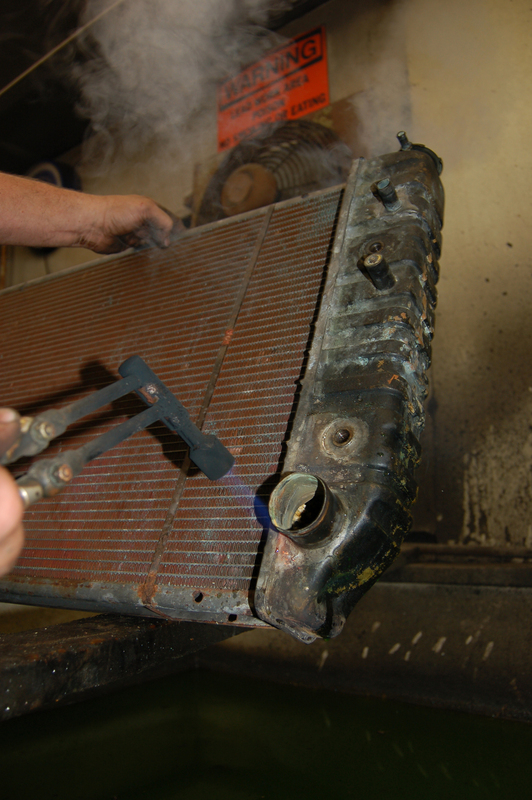 While it’s rare anymore to send an automotive radiator out for repair, it’s actually quite commonly done with trucks and off-road equipment. Part of the reason why the replacement cost is so high is because the materials used are usually copper and brass, two expensive metals, which are worth quite a bit, even on the scrap market. We were actually lucky in this situation that no major engine damage occurred, and the lesson we learned is that properly training your team can help alert you to, or even avoid, major problems from happening. Since then we added cooling system training to our operator and crew programs, so employees can learn more about the machines they work with each day. The hope is that the more familiar they become with their equipment, how it works, and what to look for, that they can raise those red flags before it is too late.